All too often, catchers miss opportunities to steal additional outs that the opposing team is willing to give them because they shut it down too soon before all the possible plays have been made. 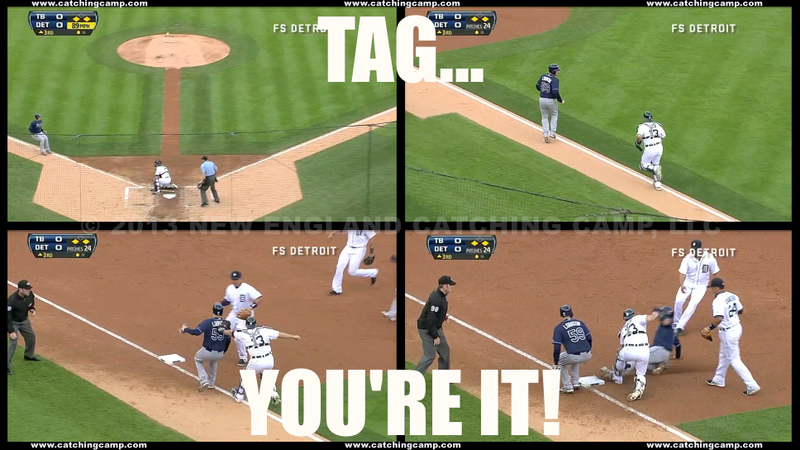 While Alex Avila of the Detroit Tigers didn't have far to go to make the 2nd tag during this play, he never stopped looking for the next out and shut down Tampa Bay's bid for a big 3rd inning in tonight's game. Catchers, always be looking for another out. Sometimes that out won't be as close as this one was to Avila, but whether it's after a successful rundown, a tag play at homeplate, a strikeout or any other situation in which the ball will be in our hands with the opportunity to look for more, stay alert and be aggressive. That one out you steal from the other team may be the difference between winning and losing.